As we are preparing to get ready and go to the Championship Baseball Game, we realize the sky is getting really dark. Sean & I go to the computers to check the weather and we are not under any weather warnings. We're looking at a line of rain moving quickly and figure it will blow through right before we go and we'll play ball. Well, as we are looking at this, we lose power and the tornado sirens go off. Hmmm--everyone to the basement as fast as you can go! We get our flashlights on and turn on the radio trying to figure out what is up. You can hear the wind and hail coming before it hits. It was hailing so hard and the winds were so strong, we were screaming at each other just to be heard. It was deafening. 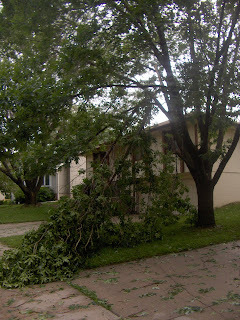 We did not have a tornado, just (ha--JUST) straight line winds with gusts up and over 80 mph. The rain and hail appeared to be falling horizontally (instead of vertically like it should). It was coming at the houses with a lot of force. We had marble sized hail and a lot of it. The way the wind and rain came down, we got a little water at the sliding glass door in the basement. We thought that was the extent of our damage. 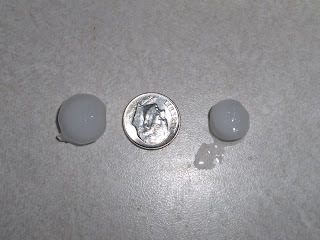 Here is some of our hail almost 15 minutes after it stopped. The front of our house saw the light twisted on the garage. We lost some fence boards and knew we had some damaged screens. Everyone up and down the street was so happy that the 'major' stuff was minor. Across the street, the wooden play set blew over onto the fence and knocked it down. 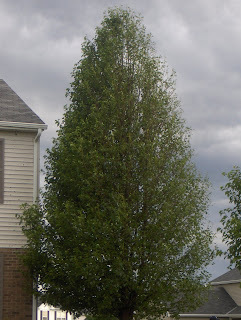 Our next door neighbor lost a limb off her tree. Then the cry came down the road. 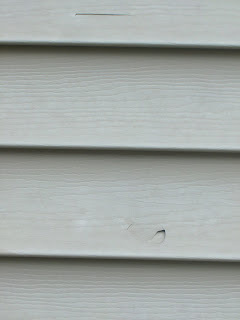 Check your siding, we have HOLES in ours. We're all thinking that this is over reaction and it's just leaves stuck to the house. 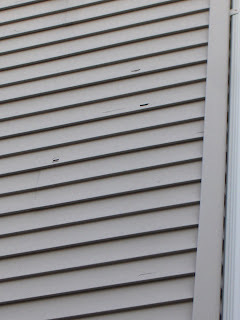 Oh no, our north and west walls are full of holes and cracks in the vinyl siding. Pea and dime sized holes. 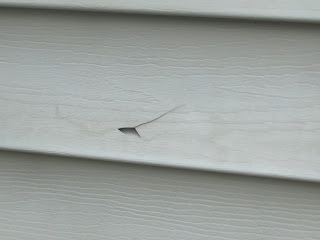 In checking out the rest of the neighborhood today, it's only our street that got the holes in the siding. We were on the path of the worst of it. Our power was out until after 5:30am today. Thankfully, the freezer didn't really thaw and we didn't lose much food at all. We're grateful to have power as some people will most likely not get power for one week. 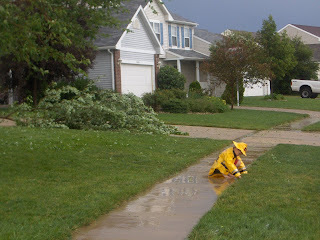 Below is Nathan playing in the water in his fireman raincoat. He's ready to help anyone who needs assistance! You can see our neighbor's tree limb down. The other picture is of our former house. We went to check on it to make sure all was well before we close on the sale of it. Lost a large limb in front. Didn't hit a house or driveway, so not a big deal. Just hard work to get it cut and cleaned up. 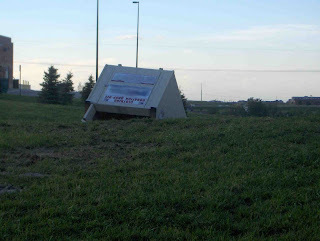 Clothing donation house at school tumbled two to three times and landed upside down. 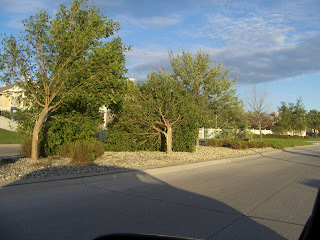 Then check out one of the trees in our area. If you look, you'll see the left half is normal and the right half lost most of the leaves. 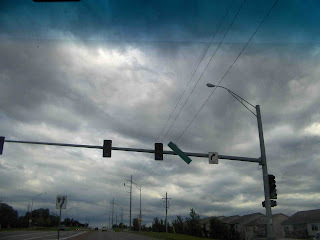 Street signs are crooked all over the place and stop signs are bent and twisted. Some were even snapped off at the base and blown across streets. 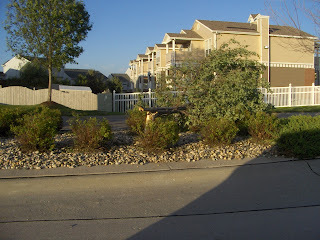 Here are some trees that were twisted in the wind and snapped. I hate to see so many trees down! 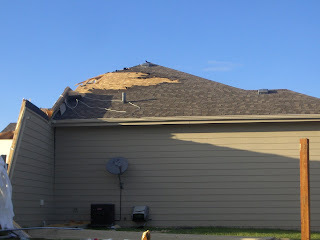 Below is the absolute worst damage we saw. It's a couple miles from us, but close enough to make you thankful for what you do have. 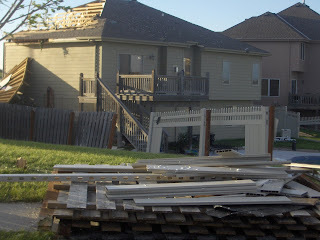 Coming up from the back, we see the fence is down and blown all over and the roof was ripped to the framework. Then as we get closer, you start to see the extent of the damage. 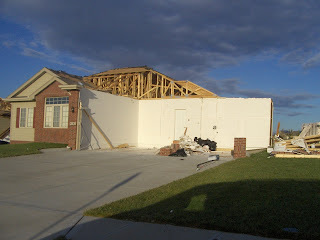 The garage was blown completely off the house. The wall entering the home and the wall that the walkway to the front door is on still stand. 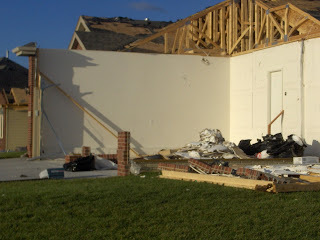 We saw pieces of the garage door, the shingles, wood, garage rails, etc. up to 1 1/2 blocks away. 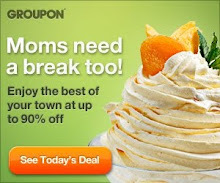 In many respects, this was worse than a tornado. Tornadoes are bad and hit small areas, but this was very widespread and hit across the entire city. 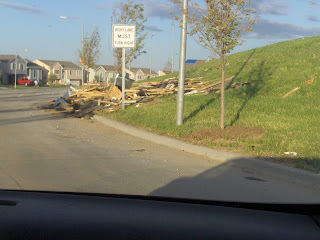 With the winds as high as they were, it was worse than a small tornado. 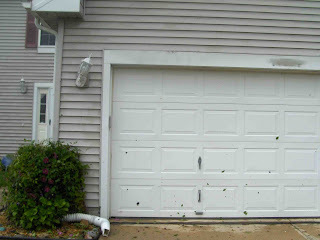 We're guessing that their garage door couldn't take the force of the wind and buckled. When that happens, the garage becomes like a balloon filling with air. It can only hold so much before it pops. There were two houses side by side without garages on them and the third house only lost one window. 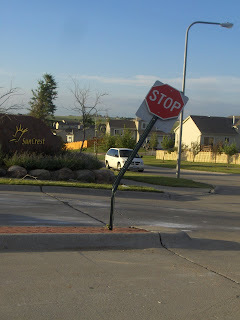 Not just your street got the damage. 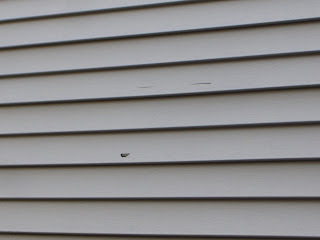 Everyone on our street with the "new and improved" siding has the holes too.